1. Peer Intelligence by all interested stakeholders to create a Reference Model for the overall real site work systems that matters to the partnership. The Sustainable Development Goals are an example of such a global reference model. 2. Translation of the global Reference Model into a site/Partner Specific Reference Model for the partner1 in each country of the world2. 3. Monitoring & Evaluation by each partner, or a representative, of the operations in the livelihood/Partner Work System with respect to the expected performance as expressed in the site/Partner Specific Reference Model. Each partner includes in the Problem & Gap Register: failures to achieve performance targets (problems), and gaps regarding the resources that are needed to achieve those targets. 4. Problem Mapping sorts the observed problems by level of scope3 of solving, and by priority. internationally, involving the international specialized organisations and representatives of relevant economic activities and civil society. 6. 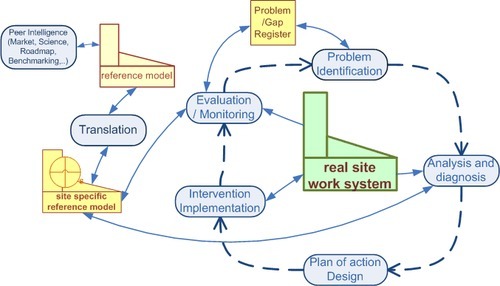 Plan of Action design proposes for each problem mess (that is loosely coupled to others) a therapeutic hypothesis that prescribes changes for the various stakeholders. Here a coherence check is required: changes prescribed for solving one problem (mess) may contribute to another problem. Negotiations involving the various stakeholders must finalize the collaborative and role-specific Change Plan. 7. Intervention is done by each role or person, if needed supported by an "extension worker." The partnership capability will nurture synergy as partners plan actions or initiatives at their level of scope with suitable transparency across the levels, nationally and internationally. The transparency will enable feedback loops and peer learning among the partners. At each level of scope, the target is to obtain a sufficiently strong Diagnostic Hypothesis explaining the problem mess (and its impacts). The diagnostic hypothesis should then serve as a basis for the next phase. Root cause and cause-effect analyses would be typical tools. for loosely coupled problems, local regulative cycles may run with shorter cycle time than the national and international ones. Phases 2 and 3 may feed back lessons learned to the (Overall) Reference Model or the Partner Specific Reference Model. 1. An incomplete list of such partner(-role)s is in the Actor Atlas: Included Actors. 2. There is an illustration in the partner lists as part of the Philippines social capital wiki. 3. The subsidiarity principle is used when determining the "level" at which the problem will be solved. 4. The classes of economic activities are those of ISIC, as listed at Sector Maps, in the Actor Atlas for international use, or at Industry for domestic use in the Philippines, for example. 5. The functions of government (class level) are those of COFOG, as listed at Government Function Maps for international reference. The domestic implementation of those functions can be addressed in function maps as listed at Government for the Philippines.